"My job is to tell the whole story of public safety." 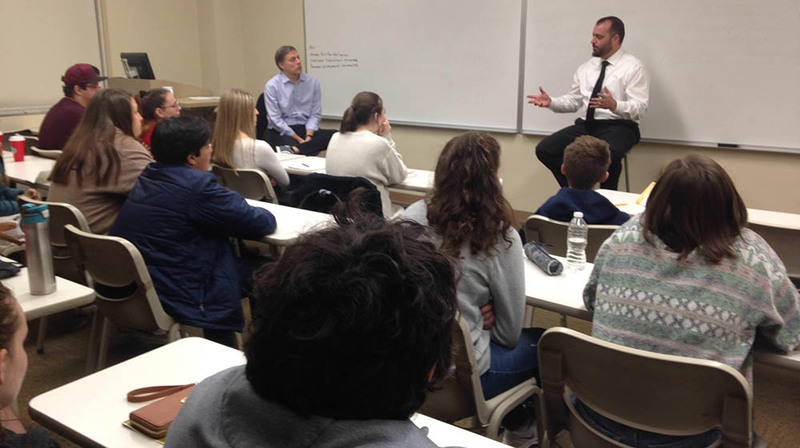 At Point Park University's High School Media Day Nov. 2, students heard first-hand from the City of Pittsburgh's public information officer about the shooting at the Tree of Life synagogue in Squirrel Hill. As public information officer, Chris Togneri – a part-time instructor in Point Park's School of Communication – relayed a constant stream of information from police to media during the shooting, when a gunman killed 11 congregants in an alleged anti-Semitic hate crime Oct. 27. “They wanted all the information to come from one place,” Togneri said. Gov. Tom Wolf, Pittsburgh Mayor Bill Peduto, U.S. Rep. Keith Rothfus and U.S. Rep. Conor Lamb were among officials to arrive at the scene. “I went to the media and said, ‘The shooter is in custody. We don’t know if there’s another shooter. It’s still a very dangerous scene. There could be any number of possibilities still that we have to address, but we can confirm there are multiple casualties inside and at least three officers shot,’” Togneri told the students. That statement was filmed and used by local and national media alike, so widely broadcast that his wife took a photo of his son seeing it on CNN. One visiting student asked Togneri, with 20 years as a reporter in Slovakia, California and locally at the Pittsburgh Tribune-Review, if he would recommend journalism experience before other communications jobs, like the one he has held since being named the public information officer in April. As public information officer, he either is working to communicate information during major incidents, like last month’s shooting or finding stories to pitch to media. He also releases stories directly through the city’s public safety department, and is working with Point Park's Center for Media Innovation on a podcast that features different glimpses behind the scenes. “My job is to tell the whole story of public safety,” he said. When one student asked if he ever got attached to people who were a part of the stories he reported, Togneri said covering major disasters always requires forming relationships. He recalled reporting on the Upper Big Branch Coal Mine explosion in 2010 that left 29 miners dead in West Virginia. At the time when he spoke to high school students, less than a week had passed since the shooting and Togneri told them he hadn’t had much time to sleep, or process how he was feeling about what had happened.